Kettlebell Workouts for Dynamic Strength! No two ways about it, kettlebell workouts areawesome. There are tons of exercises you can do, & it's cool to show off these cannonball-like tools to your friends. Already know something about kettlebells? Love 'em or hate 'em? Sound off about your experiences below! Bad jokes aside, this is good basic info. There's also info on whether kettlebell strength training is right for you, and easier and cheaper ways of getting it done than you might think. Are Kettlebell Athletics Right for You? There's a ton of hype about kettlebell strength training, some of it truth and some of it just slick marketing talk. This article lets you sort the wheat from the chaff. Find out if you're one of the people that will benefit from kettlebell exercise. You'll know if you should do more research, or whether kettlebells aren't your thing. Want info about what kinds of exercises you can do? Look no further! This is your guide to exercises and ideas. This covers the kettlebell swing, clean, press, and Turkish get-up. Good basic, starting exercises. If you're looking to start working out with kettlebells, or get some more, take a look. This page compares 8 different kettlebell seller's prices online, so you can find the cheapest one. These are two kettlebell workouts you can use. One is tailored for strength, the other for stamina. I've said it other places, but it bears repeating; without a good plan, your workouts will go nowhere! Having faith in your plan will keep you focused and looking for real results. The single best exercise I have found for leg endurance. Kettlebell workouts with swings give you legs that keep on going long after other people's have given out. Also, it's much less stressful on the knees than running. Another reason I like it so much, since I really like my knees. The kettlebell press hits your upper body hard. It's a great lift for shoulders and arms - and it feels great to push that piece of metal over your head in victory! Be careful with this exercise, though. If you are too enthusiastic when you start you can damage you rotator cuff - not fun. So, know your limits and lift heavy right up to them. And the kettlebell clean, this is an exercise that your whole body works to perform. This explosive movement with your legs and upper body is great for sports and martial arts. This exercise is a combination of the clean and press, unsurprisingly. You get the benefits of both explosive movements in one exercise! Learn the correct form for the exercise and use it to build functional, dynamic strength. Try it once you've got the hang of the clean and press individually - then add it to your own kettlebell workouts. The turkish get up is another great exercise, for kettlebells or dumbbells. It develops full body strength and a strong core. Learn how to safely do kettlebell snatches. These are more advanced than swings and cleans, but are even more intense. Master the other kettlebell lifts before you check out this one. If you're buying a kettlebell, you don't want to buy crap. A good one will last a long, long time in your kettlebell workouts. And a bad one will rip up your hands - and maybe even break. Check out this page for reviews of different kettlebell brands. Find out which are great, which are OK, and which you should avoid. Check out this page to see visitor's reviews of different k-bell DVDs on the market. A DVD is so much more helpful than a book for getting form correct (and safe) for your kettlebell workouts and exercises. This page addresses you concerns about buying kettelbells. Where the best places to buy kettlebells are, what weight you should start with, are kettlebells right for you, etc., etc. Find out how to prevent common kettelbell injuries and how to exercise safely. It's pretty easy to get it right, but get it right in the beginning - since getting hurt and starting over is no fun at all. If you like this info about kettlebells, you can also subscribe to my monthly E-Zine, Starting Strong. It keeps you updated about new pages and info added to Complete-Strength-Training.com, and includes select articles. You'll also get the free e-book Train Smart, Eat Smart: Exercise Nutrition Hacks! Sign up below! Also, if you already know a little about kettlebells you probably either like 'em or hate 'em. Sound off about them below! Do You Love, or Hate, Kettlebells? The debate still rages! 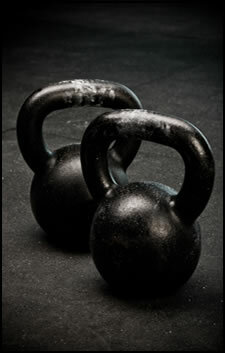 Are kettlebells all they're cracked up to be, or not the greatest thing since cast iron? Share a story about knowledge you've gained in the gym! Entering your story is easy to do. Just type, sharing an your experience doing kettlebell training, amazing or appalling! Read Other Visitor's Stories, Knowledge, and Rants! So You Wanna Know About Kettle Bells, Huh? So, there's your comprehensive intro to lifting and kettlebell workouts. Everything you need to get started, and just try the exercises with dumbbells if nothing else. • Click here to leave 'Kettlebell Workouts for Dynamic Strength!' & go back to the Complete Strength Training Home-page.